I’ve worked in an organization where the expected development flow was to produce a Microsoft Word document, check it in to revision control, have others comment on it (in revision control), resolve comments, and then, finally, write code. After coding, you were supposed to go back and revise the document to match the actual outcome. This rarely happened. And you know where I like my specs to come from? Ideally, as a product from the actual, running code. Specs are specs, but code is reality. Here’s two familiar examples of this. First: JavaDoc. Yes, your spec comes out as an HTML file, which you edit in the IDE. A slightly more interesting common example is a command-line options parser. The options parser typically describes something about the allowed values of the switches, which are required, and other “metadata”. This information is used runtime validity testing, and also to produce your –help listing. Spec from code! State machines are cool. 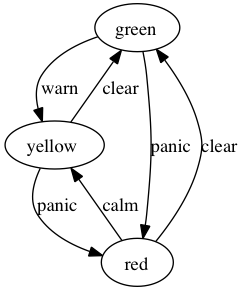 Tricky interactions can sometimes be more clearly phrased as a state machine. Instead of having a jillion little booleans and flags, you have one main state, and maybe some ancillary variables. You process an “event”, and that may change the “state”, and cause other things to happen, too. The framework then gives you callbacks like ongreen() and oncalm() where you can do your application-specific work. I was looking at it, and thought, Hey! That’s enough information to produce some documentation! You can see the connection, yes? Doing design work up front is important. But at some point, the code acquires a richer life than your predesign spec. After that, in a very real sense, the only spec is the code, itself. If you can force it to document itself, to reveal aspects of itself at appropriate levels of abstraction, you can continue to understand it.